There's no occasion more joyous than the arrival of a new baby. When a baby boy makes his first appearance in this world, it's the perfect opportunity to pamper parents and newborn alike! 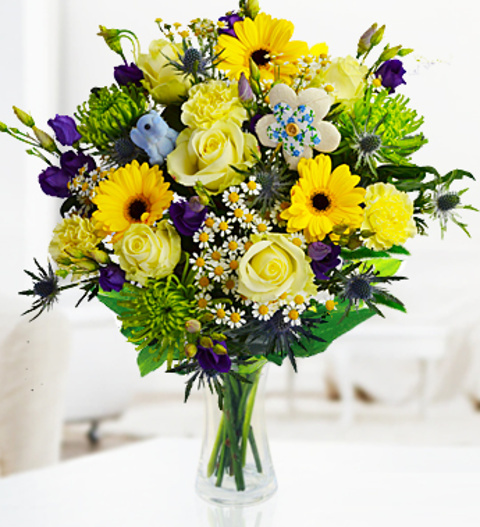 Our New Baby Boy bouquet includes Eringium, Eustoma, Shamrock blossoms, Avalanche roses, Carnations, and Stallion chrysanthemums arranged to perfection by our expert florists. This flower arrangement also includes a cute Baby Elephant as well as a pink and blue flower pick so the happy family will have something to treasure forever. Since babies have a way of surprising us with an unscheduled arrival, this arrangement is available for next day delivery! Chocolates may contain nuts.